Adding new lanes on both sides of SH20 between Queenstown Road and Neilson Street. A massive new motorway interchange at Neilson St to link people directly to the new road and to Onehunga as well as widening Onehunga Harbour Rd to four lanes. Widening Neilson Street to four lanes and upgrading the Captain Springs Road/Neilson Street intersection – note: it seems the widening is only as far as Captain Springs Rd, not all the way to Church St. Even at this early stage the NZTA suggest the entire project will cost $1 billion. If they carry on with the current thinking then my guess is that the cost will probably start pushing up closer to $1.5 billion. AT/NZTA say they are going to be working closely with local community on some aspects of the project and one of those is the Neilson St interchange – or Gloucester Park Interchange as they now seem to be calling it. I’ve been sent a presentation following a stakeholder workshop earlier this month looking at the options for this interchange. I don’t know which stakeholders are involved but one will almost certainly be The Onehunga Enhancement Society (TOES). They’re one of the key groups behind current foreshore restoration but they’re also the ones who came up with a horrific alternative plan to put an eight lane road along the foreshore and all the way to Highbrook. As I understand it, one line of their thinking is that if a massive new road is built then as mitigation they can replicate the current foreshore restoration on the inlet. While the eight lane motorway thankfully isn’t happening it seems AT/NZTA are considering some of their ideas for the interchange. The following images show the potential options being considered for the interchange, in all you can see the route for the rail line to get to the airport. 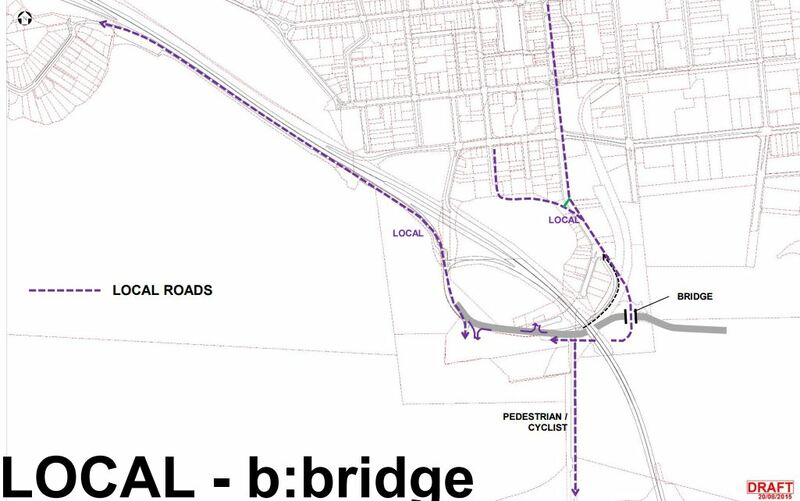 Option A1 is a version of the TOES concept and amongst other things would require a new bridge across the harbour to go with the two motorway bridges, a rail bridge and a walking/cycling bridge. 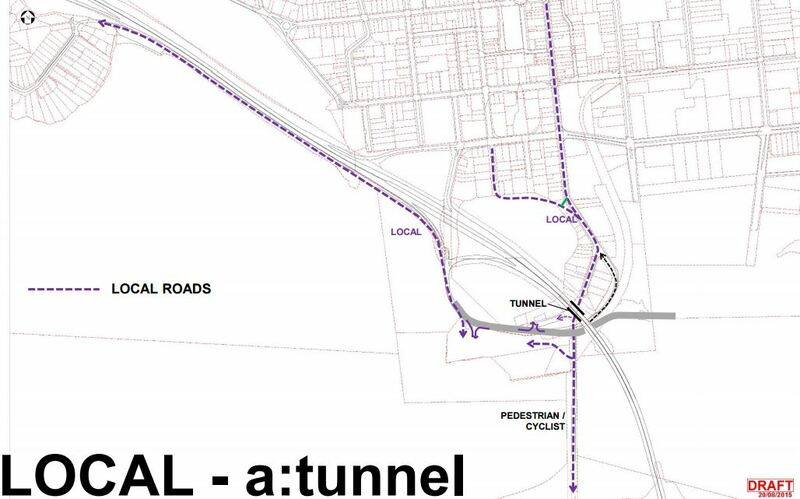 There’s also a tunnel to link people heading south on SH20 to the E-W Link. It’s actually slightly scaled back from the TOES original version which had the blue connection also as a new bridge. 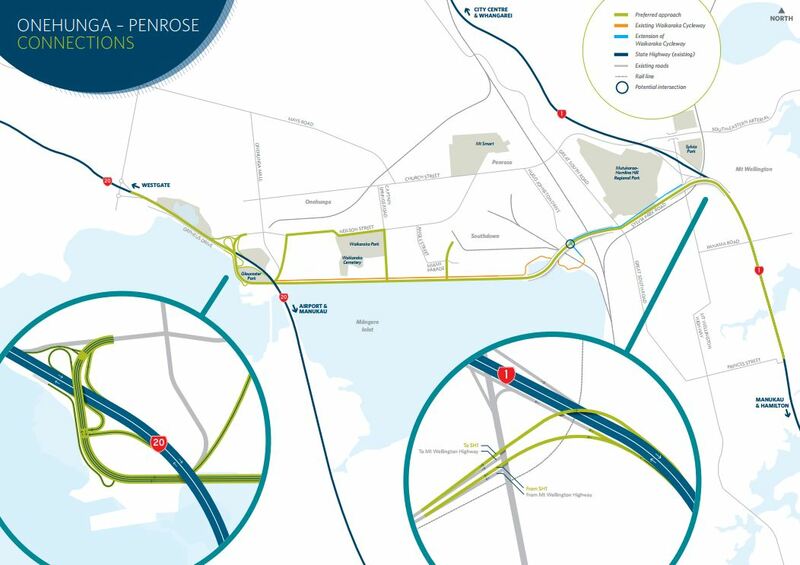 As you can see from the image, it doesn’t add any additional road crossings of the harbour, and instead sends traffic to/from Onehunga or the motorway via a new bridge over the motorway. 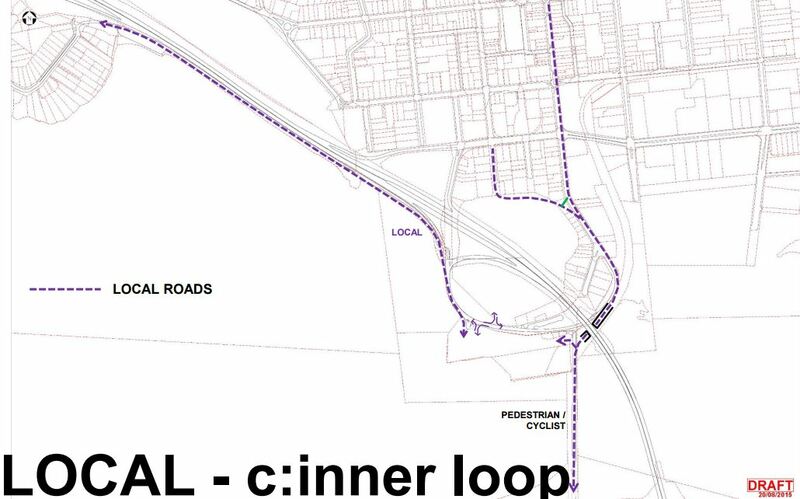 The NZTA have also come up with two composite options which they’re calling Option C.
As the new road is intended to be limited access – i.e. no driveways – these plans would make it impossible to access some of the neighbouring properties such as the wharf. There are three options for how to retain local road and therefore walking/cycling access. Option B is a bridge over the top of the road – this would likely link in with option A and both option Cs above. Option C is what they call an inner loop but which appears to be a tunnel using part of the old rail designation. Where local roads can go over, not under, the East West Connection arterial. Possibilities for cut and cover of the East West Connection arterial opposite the Wharf area. Alternatives for the suggested bridge, which crosses SH20 in the current options, to become a tunnel. As you can see just from this small section alone, it is likely to be hugely expensive to build this road, which will probably do little for truck congestion because the road will be filled with single occupant cars. If the project was really about providing better access for trucks then they’d be getting on with fixing Neilson St and adding measures like truck lanes. That they’re not doing this only adds to my feeling that this is a make-work scheme for road planners/engineers, and a predetermined solution in search of a problem – much like another road crossing of the Waitemata Harbour. There’s probably also a case of those working on the project being beholden to the crazy demands of the stakeholders such as TOES and the trucking companies. $1billion. Because they refuse to fix three intersections. There’s a cycleway extension though! Which isn’t a sop after a Moar Roadz monstrosity is built! At all, honest. I believe that this single project – to be built without any compelling economic or safety justification – will cost more than all the cycleways in NZ this entire decade. More likely several times the total investment in cycleways ever spent in NZ. The fact that the rampant motorway under this government building appears unstoppable and unsatiable makes me think it will be a long long time before Auckland and NZ turn the corner and start seriously developing alternatives to purely car transport. It’s amazing what you can get spent on you if you are a director of Mainfreight or Toll Holdings. The favouring of a very few companies with hundreds of millions in public investment is the definition of crony capitalism, and should see us slide down the transparent government rankings. (It won’t). Meantime, someone should ask for the minutes of meetings between the Minister and representatives of trucking companies which considered this road. To be fair, Richard Prebble, who is a director of Mainfreight is calling for much more spending on rail and has questioned the ‘more roads’ agenda. More excessive road capacity in search of demand? This is Exactly what Auckland and Onehunga needs. Two motorways within 1km is obviously NOT ENUFF for the roads to FLOW SMOOTHLY. And any of these beautiful solutions costs only $1 billion (+- $1 billion)? Bargain! P.s. What the flaming feijoas are these people smoking? This is a slight oversimplification for rhetorical purposes, of course, since in a cost benefit analysis reducing local traffic congestion suffered by other people would count on the positive side of the ledger. But I would be surprised if that makes much difference to the result. You’re probably better off asking a political reporter. I vote Adam Bennett, as he’s got a an interest and understanding of economics and government spending. At least it appears they have designated the rail to the airport on these ones (had been a bit lost originally). How much thought has gone into grade separation? Which goes over & under? Assume rail still has to go under Neilson St. How do they fit under the motorway bridge while staying well above sea level? If you want to get around in Auckland public transport is bad in other words they are saying use roads. Thanks for your post on this subject. I wonder if there is an analysis of the destinations for those using this route? If you made a submission to the NZTA about the East West Link, thinking it was in confidence, I can tell you the results were “shopped” to the truckers, AA and Auckland Business Forum before the public knew. Surely this is illegal. Oh, and this whole East West Link promo is being run by a spin doctor, hired by the Auckland Business Forum. We have been lead up the cycle way on a grand scale. Did NZTA show these other organisations negative feedback so they can prepare counter arguments? By default submissions are classified as official information, discoverable under the OIA, so anyone expecting theirs to be kept confidential without an OIA-valid reason could well be in for an unpleasant surprise. AT/NZTA have been talking to these groups for a long time and giving them a lot of advanced information. I heard unofficially that they had come up with with preferred option in late 2013. I wrote a post hypothesising on the route. A few weeks later I was talking to someone from one of those organisations who told me he read the post and had thought I was mad only for him to get an official briefing a few day later showing him the route. This was before even the first consultation on the route which is all just to pretend to be listening. All the work in last two years has been about justifying the decision made years ago. Thank you Jack, could you give a bit of detail regarding the spin Doctors please? 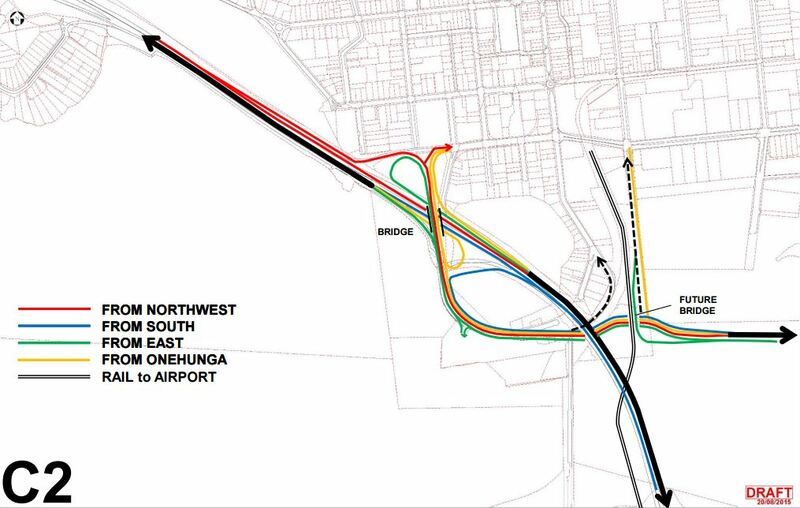 Shouldn’t those who want this project be calling it the South Auckland Truck Loop? Patrick, the truck congestion isn’t caused by trucks serving the industrial area. It’s caused by the thousands of daily truck movements to and from the rail terminal at Southdown, which acts as a hub for all of Auckland. Two other options would be to spread the task by having feeder rail hubs in West Auckland, Tamaki and South Auckland, or relocating Metroport to nearer SH1 or SH20. An even easier change would be to require Metroport to use a vehicle booking system like Ports of Auckland do. In other words require them to manage truck numbers so all of the trucks to pick up/drop off containers don’t all turn up at once. Currently Metroport refuse to use one as they consider a turn up any time approach to be a commercial point of difference. That’s all well but when it then imposes costs on Auckland Ratepayers then that practice needs to change. The Metroport’s own truck counter showed movements of 38 trucks an hour at peak. There are simply not thousands of truck movements, which further proves this motorway is not needed. There are thousands of single person car trips though. And the truck counter suddenly disappeared. I think I can work out why. There’s around 500-600 TEU handled per day by MP, which would equate to close to 1000 truck movements alone including inwards and outwards, assuming most trucks carry one container (same take two). But that’s just MP – there are many other trucks coming and going from the overall terminal. Patrick that is interesting, is there any on/off ramp detail for the Onehunga ramps? Surely Neilson is big enough and ugly enough to provide an east-west link all by itself. To help those truckies crawling along Great South Road and Onehunga Mall I would blow away the median, add a few extra links (e.g. Southern to Southeastern) and make some selective compulsory purchases (e.g. a direct route from Neilson to Southwestern westbound). Even a honking great flyover over Neilson from Onehunga Mall to the Southwestern would be preferable to tarsealing the foreshore. It is a principle of planning or if it isn’t, it should be, that the mode of rail or metro rail should be attended to prior to any road construction. The reason for this is that rail requires a level track and is the most effective when it travels in as straight a line as possible to its ultimate destination. Roads are more accommodating and are still effective for vehicle travel with curves and changes of level. This however, does not mean they should be preferred ahead of rail. 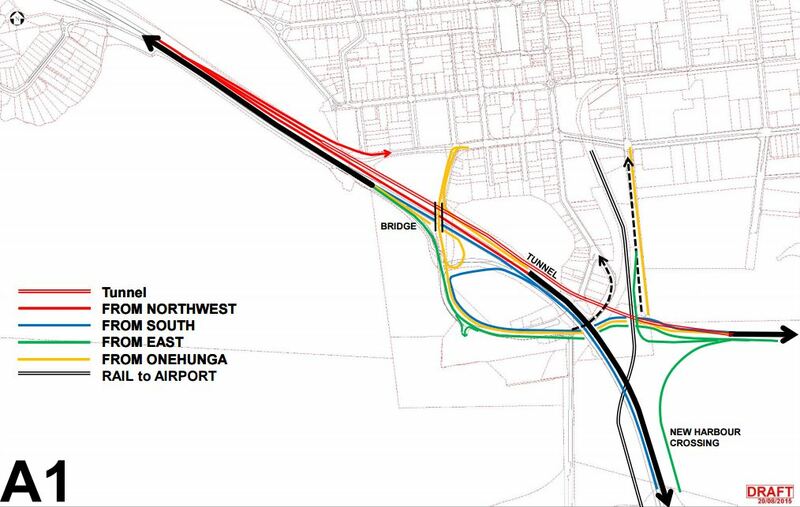 In my view the government/NZTA should extend the Onehunga line as a double line to Mangere Bridge shops whether or not the final chosen route to the Airport is through Mangere Bridge or from the Otahuhu alternative. This would increase the PT catchment to many isthmus destinations and would be counter to always need to take a car to get to cross that little stretch of water. Do this before any money is spent on East-West Connection roading and I bet the BCR won’t be worse than current NZTA proposals in thepost above.